We’re sure that you’ve seen the food bags on the shelf while visiting our clinic with the urinary health, urine pH control etc.. What’s the big fuss you ask? Do I really need to buy a special food to help my pet urinate?. Cats tend to be over represented with respect to lower urinary tract disease, although dogs can be affected as well. Feline lower urinary tract disease, or FLUTD for short, refers to a group of symptoms that can affect the bladder and urethra. You might notice your cat licking his/her hind end excessively or you find that your cat is urinating outside the litter box. This is due to discomfort and trying to avoid the place of pain (ie the litter box). Middle age, overweight cats in multicat households that eat store brand dry diets are at greater risk. Stress such as a change in routine can be an additional risk factor as well. If your pet is experiencing these symptoms, it is important to seek veterinary care promptly. After a thorough physical exam, your veterinarian will likely obtain a urine sample to look for evidence of infection, inflammation, crystals or blood. Depending on the results of the urinalysis, a urine culture (to check for infection), blood profile or x-rays of the urinary tract may be recommended. 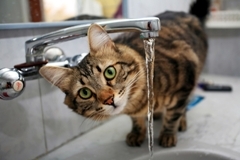 The most common cause of FLUTD is Feline idiopathic cystitis (FIC). This is usually a diagnosis of exclusion, once all other potential causes are ruled out. Put simply, FIC is essentially an inflammation of the urinary tract that is not bacterial in origin. Urethral muscle spasm and bladder discomfort causes affected cats to strain to urinate, often urinating small frequent amounts of bloody urine. The good news is that it often resolves on its own in a couple of weeks. Treatment usually involves pain medication and antispasmodics as well at the recommendation to feed a prescription canned urinary diet and plenty of access to fresh water to prevent recurrence of clinical signs and obstruction. Urinary stones are another possible cause of FLUTD. These can be detected by x-ray or ultrasound. The two most common stones are calcium oxylate and struvite, but unfortunately the stone identity can only be determined once the stone is retrieved – usually by surgery. Struvite stones often arise secondary to a urinary tract infection. It is possible for these stones to dissolve with a special dissolution diet and resolution of the antibiotic with the appropriate antibiotic. If the stones fail to dissolve with medial management, surgery to remove the stones would be necessary. Calcium oxylate stones will not dissolve with medical management alone. Surgery is necessary to remove these stones. Once recovered from surgery a prescription urinary pH control diet and increasing water intake is key to trying to prevent these stones from reoccurring. Urinary obstruction occurs when the urethra (a small tube which drains the bladder) becomes partially or completely blocked secondary to a stone, grit (a collection of minerals/cells), or a mucus like plug. Males are at a higher risk due to their long, narrow urethras. If the obstruction is not relieved it can result in a build up of toxins in the body, as they can no longer be eliminated by the kidneys. It is a very painful condition, and if left untreated it can result in bladder rupture, urethral tear, kidney damage, heart failure and/or death. Urinary obstruction is a medical emergency and requires treatment immediately. If you notice your cat crying, going in and out of the litter box with little/no urine production, licking his/her hind end excessively or trying to urinate out of the box – take you cat to your veterinarian ASAP! So what can be done to prevent your cat from experiencing FLUTD? plenty of access to fresh water is an important place to start. keeping the litter box in a quiet place and trying to minimize stress/changes in routine can help as well. Similarly to their feline counterparts, dogs can also experience urinary tract infections and urinary stones and the above information can be applied to them as well. If you have additional questions about your pet’s urinary health, contact your veterinarian to see what you can to to maintain urinary health in your pet.